The types of pathogens (disease-causing organisms) which infect humans, plants, and other animals are amazingly diverse. You may naturally think most often of bacteria or viruses, but there are other types of pathogens which cause disease. Within each group, there are many different kinds of pathogens, each with its own structure, transmission method, type of host it infects, disease symptoms that it causes, tissues it targets, and disease death rates. This lesson provides just a brief summary of the types of pathogens that infect humans and a few examples. Keep in mind the great diversity of infectious disease organisms during your study of pathogens. You may only deal with viruses when you build models with the programs discussed in Pandem Data, but the other pathogens are no less damaging to human health. For more detailed information on types of pathogens, see the curriculum resources in the Pandem Disease Center. Model of an influenza virus. Photo Credit: NIH. Viruses are made up of a protein coat, or capsid, which encloses either DNA or RNA, the genetic code for the virus. 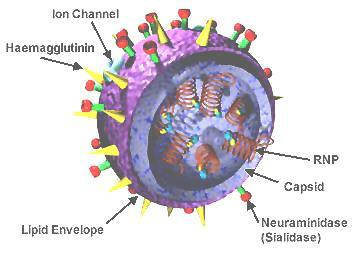 Some viruses also have a membrane (made up of lipids) that covers the capsid, but not all viruses have this membrane. Other features of some viruses make them very well adapted for causing disease. The features are not additional components; they are part of the protein coat or viral genetic material. For example, the protein coat consists of one or more types of protein subunits arranged in various shapes, depending on the virus type. Some viral coats have spikes and tails. Spikes and tails help the virus bind to receptor sites on host body cells. Once inside the body cell, viral DNA or RNA can be replicated and thousands of new viral particles are produced. The host cell dies and the new viral particles infect more host cells. Viruses cause many diseases from the mild common cold to influenza to the deadly Ebola hemorrhagic disease. Symptoms are different for every disease as viruses target different body tissues with varied effects. 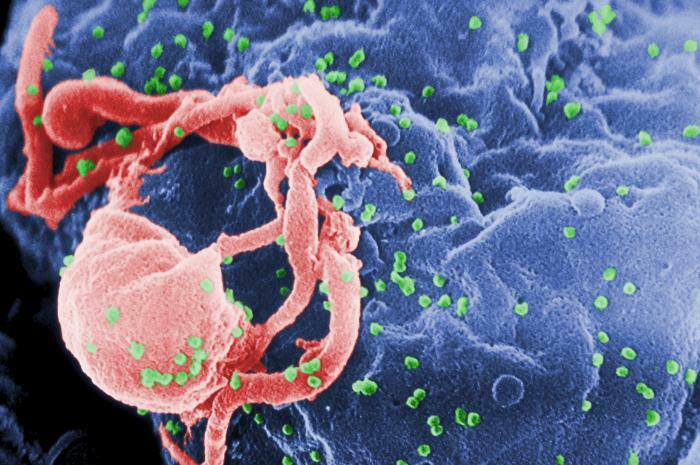 One example, HIV (Human Immunodeficiency Virus), is caused by a single-stranded RNA retrovirus. It attacks and gradually destroys the body’s immune system. It is considered a pandemic disease by the World Health Organization (WHO) and has killed over 25 million people worldwide. The number of infected each year continues to increase. There is a period of latency in the beginning of the infection during which the infected person has few symptoms. Eventually, HIV progresses to Acquired Immunodeficiency Syndrome (AIDS) during which the victim experiences weight loss, profuse night sweats, fatigue, swelling of lymph glands, diarrhea, sores, pneumonia, memory loss, cancer, chronic wasting disease, and neurological disorders. HIV is a death sentence. It can be treated to delay death, but it cannot be cured. There are vaccines to prevent some viral diseases, but we cannot cure them. 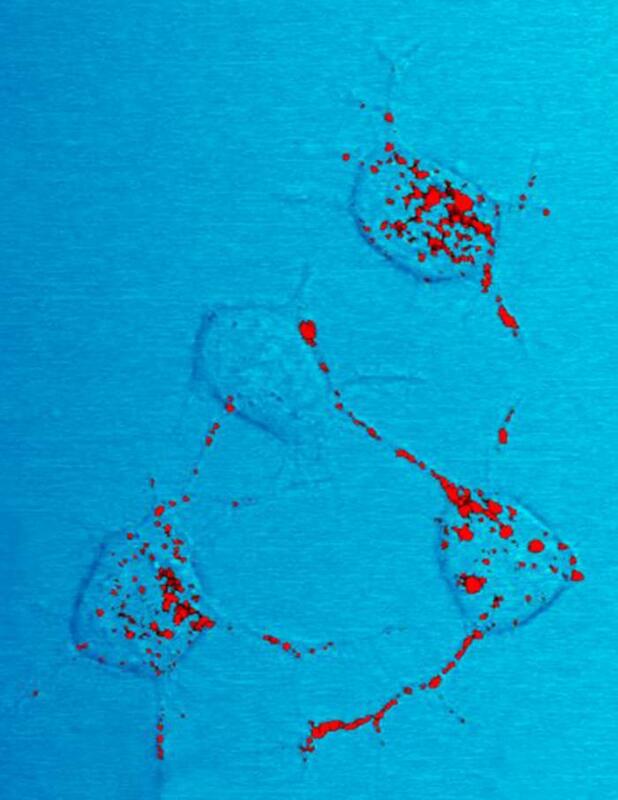 A neuron showing the presence of a prion protein (in red). Photo Credit: NIAID. Having an even simpler structure than viruses, prions consist only of protein, yet are the cause of fatal diseases. A prion protein has multiple folding patterns and is capable of causing abnormal folding of normal proteins found mostly in the brain. The abnormal folding leads to brain damage, neuron loss, and neurodegenerative disorders. All prion diseases are fatal. Bacteria are single-celled, prokaryotic organisms. Prokaryotic organisms do not have membrane-covered organelles. They have remarkable reproductive capability and metabolic diversity and live in most environments. 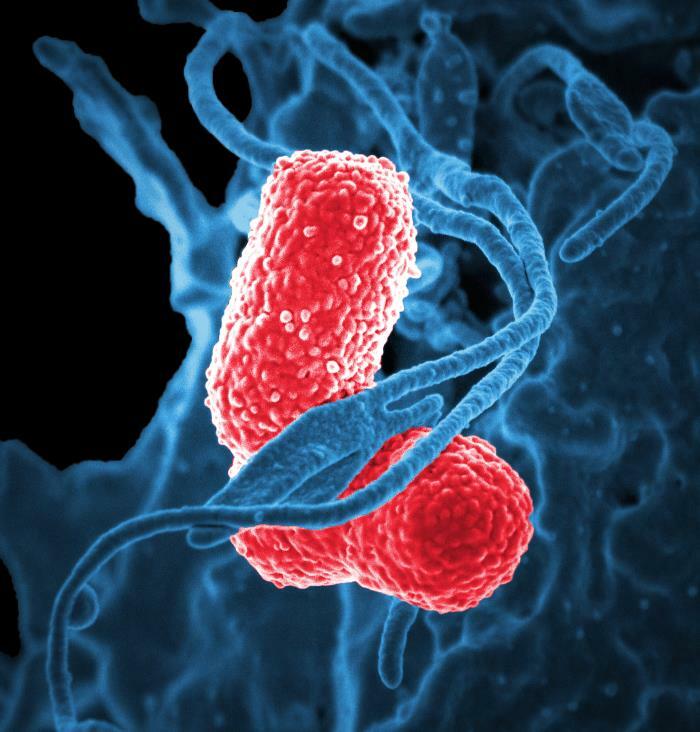 Bacteria can be helpful or harmful, but it is the infectious disease-causing bacteria that are considered in this lesson. As with the other pathogen groups, bacteria have diverse structures with very different functions. Bacteria are generally cocci (round), bacilli (rod-shaped), or spirilla (spiral-shaped), but there are varieties within those groups. Some bacteria have capsules surrounding the outer cell wall and others produce a slime layer or biofilm. Some have flagella, a long hair-like structure, some have more than one flagella, and still others have cilia-short hair-like structures that surround the cell. Bacteria cause diseases such as MRSA (methicillin resistant Staphylococcus aureus), pneumonia, strep throat, cholera, anthrax, gonorrhea, botulism, Lyme disease, scarlet fever, typhoid, and tetanus. 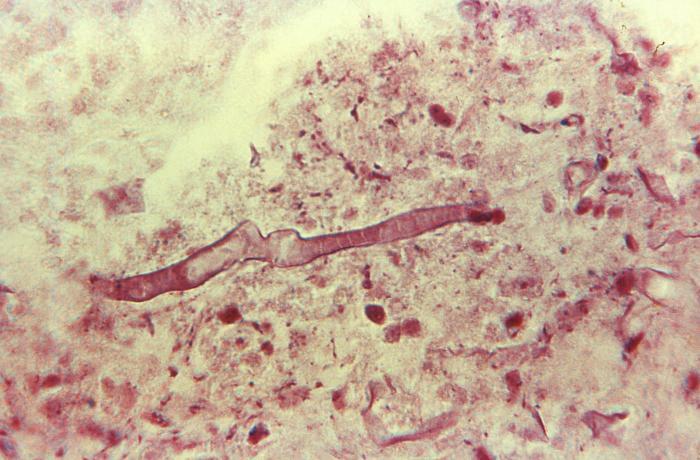 Helminths are invertebrates with worm-like, flat or rounded, bodies. They have very different characteristics according to type and have very different hosts and life cycles. Hosts and life cycles can play major roles in trying to prevent infectious diseases caused by helminths. Pathogenic helminths include the flatworms (flukes and tapeworms) and the roundworms. Both groups have parasitic members which infect, live in, and sometimes kill humans. While host defenses can eliminate some helminth infections, some types last for years as the helminth successfully avoids the host immune responses. Because the worms can migrate through the body they can damage a variety of host organs disrupting function, laying eggs, and continuing the life cycle when they exit the body. Helminths have egg, larva, and adult stages. The epidemiology of prevention and control of infectious helminth disease relies on an understanding of the growth and development of various helminth life stages. Transmission during life stages, proper diagnosis of the disease, treatment of patient having the parasites, and the prevention and control of the disease are affected by features of the parasite and its very specific life cycle. Helminths that parasitize humans include the liver fluke, various blood flukes, lung flukes, pinworms, hookworms, and tapeworms. Symptoms vary with the parasite infestation, but can include nausea, weakness, diarrhea, abdominal pain, intense itching as the worms or larva attempt to leave the body, and blindness. As with bacteria, there are helpful and harmful fungi. Here we consider only the harmful, pathogenic fungi. Fungi are single- or multi-celled, eukaryotic organisms that digest their food externally by secreting digestive enzymes and absorbing nutrients directly into their cells. They are non-motile and do not undergo photosynthesis. Fungi are classified by their reproductive structures and include the sac fungi, the club fungi, the sporangia fungi, and the “imperfect” fungi. Diseases caused by fungi include Valley Fever, Cryptococcus neoformans infections of the lung and brain, and pneumonia-like diseases. Rhizopus infections cause a variety of human fungal infections ranging from deep tissue infections to skin and gastrointestinal diseases. Some fungal diseases can be severe, causing death in a few days. Wheeling Jesuit University developed Pandem-Sim: Fighting Infectious Diseases Everywhere through a cooperative agreement with the National Institutes for Health (NIH) Science Education Partnership Award (SEPA). This project was supported by the Office of the Director, National Institutes for Health under Award Number R25OD 16542-5. The content is solely the responsibility of the authors and does not necessarily represent the official views of the National Institutes of Health.